An historic Cornish landmark has won an award, putting it up beside Blenheim Palace and Edinburgh Castle. Geevor Tin Mine Museum and Heritage Centre near Pendeen has been given the Sandford Award for Heritage Education. The awards, by the Heritage Education Trust, go to houses, museums, gardens galleries, cathedrals and artefacts. Judges said they were impressed with how interested schoolchildren from St Buryan School had been during a tour of the museum. It has recently undergone a £3m refurbishment, using many of the same materials used 200 years ago when the mine was at its height of production. 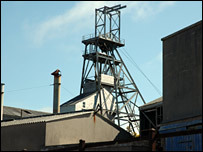 Visitors to the museum can see 18th and 19th Century mine workings during guided underground tours. It was a working mining until 1990. The site was then bought by Cornwall County Council and it is now managed by Pendeen Community Heritage. Other recipients of the Sandford Award include the Tower of London, Roman Baths and Pump Room in Bath and the Wallace Collection.